like Afro Celotto, Silvano Molin, Luciano Pavanello, Giancarlo Tagliapietra and Dino Vio. It is in this period that his colleagues give him the nickname “Crema”, due to his natural ability to gracefully shape glass as a “cream”. In 2000, while working at the Artistic Glass Factory Schiavon, he again has the opportunity to work with the great Maestro Afro Celotto, with whom he had also known at Effetre. One year later, after learning the techniques of filigrana, mosaics and tessere murrines, he decides to open a new studio with Afro Celotto and CarloTagliapietra. In 2009, when Afro Celotto left the studio, it gave Gianluca the chance to express his own talents and energy in his new collections. Today Gianluca owns his own glass studio on Murano where each day he is creating new pieces that are being collected by art enthusiasts around the world. As far as process, it can be quite involved. If we skip past the 10-12 years that it takes to become reasonably competent with the techniques, it takes a particularly gifted glassblower to gain the title of “Master”. 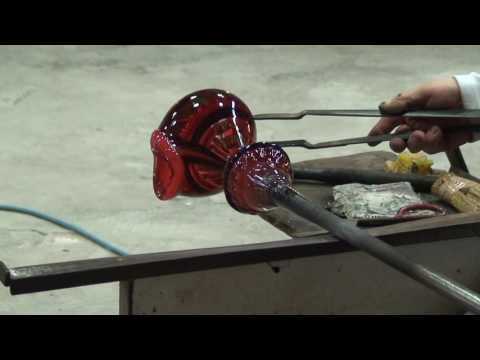 There are glassblowers on Murano who have worked in the studios for 60+ years who have never attained this status. vases their strength. After the vases are cooled they are carved or ground with a variety of sizes and shapes of grinding wheels. This step gives the pieces their unique surface texture. The very last step is for the artist to use a small Dremel tool and to sign and date the bottom of the pieces. He also writes “Murano” and 1/1 to signify they are completely unique. Art glass from Murano does not tarnish, patina or fade. A cared for piece will retain its beauty forever.